Here’s a bulky tutorial that will round-out your understanding of ZigBee wireless communications (translated). The protocol is great for hobby electronics projects because it uses low-power short range wireless devices to build a mesh network. The guide covers both hardware and software, but also takes the time to explain what that hardware is doing in the background. As you can see, several different renditions of an XBee module are used as examples. They pretty much all rely on a series of SparkFun breakout boards that each serve different purposes. Once you’ve acquired these modules, there’s a fair number of choices needed to configure them to play nicely with each other. We read most of the tutorial (we’ll save the rest for later enjoyment) and had no problem following along even without owning the hardware or being able to use the interface as we learned. Whenever we cover XBee modules we always like to mention that it’s quite easy to use these for remote sensors with no additional microcontroller needed. It can be a real drag to fix a circuit board which has stopped working as intended, especially if you don’t have any reference material for the product. That’s the position that [Todd Harrison] found himself in when the controller for his mini-lathe gave up the ghost. He undertook and hefty repair process and eventually mapped out and repaired the driver board. First off, we’re happy to report his success at the end of a year-long troubleshooting process; the entirety of which occupies six different posts. The link at the top is the conclusion, and you’ll find his final test video after the break. But as you can see from the image above, he was met with a lot of problems along the way. The first two segments show him reverse engineering the PCB, with a giant schematic coming out of the process. 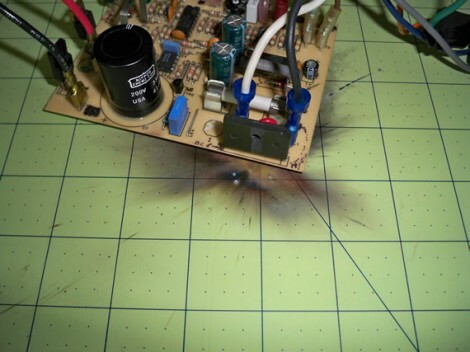 In part 3 he then started probing the board while it was live, with the smell of hot electronics causing him to disconnect the power every thirty seconds. One time he took too long and blew a resistor with the pictured results. 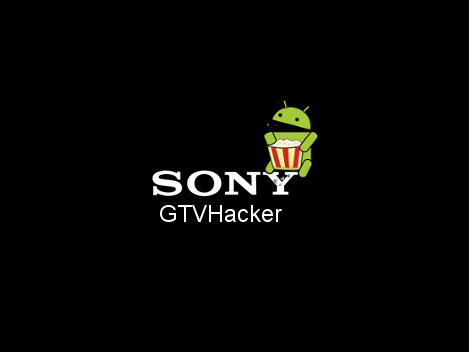 The proud cry of “I am root” rings true once again, this time on Sony Google TV devices. Although a low-level exploit was found on previous firmware versions, a downgrade process lets you run unsigned kernels on updated TV or Bluray models of the Internet streaming devices. These systems are Android-based, which currently run version 3.1 Honeycomb. This version patches the previous exploit, but with three different USB sticks you can downgrade, exploit, and upgrade to an altered and unsigned hack of the most recent kernel. This gives you the root access you may have been longing for, but other than the features discussed in the forum thread there’s not a whole lot of changes rolled into the exploit yet. We’re always looking out for open source projects running on living-room devices and hope that someday we’ll see a branch of XBMC for the GTV. Until then we’ll just have to keep our fingers crossed for the viability of a RaspberryPI XBMC. Find you’re running out of memory and paying for more expensive chips just to plug this feature gap? Many of the upper offering of chips have the option of adding SRAM thanks to an on-chip hardware feature, but if you don’t have that this 512k SRAM add-on board can be used with any chip that has 13 extra I/O pins available. That use of pins may sound crippling if you usually use low pin count chips. But thanks to a write protected state option with the memory chips, nine of those thirteen pins can serve a dual use when not reading or writing from the memory. Speaking of, the address scheme is designed to access the memory in 32-bit blocks but individual bytes are accessible too if need be. 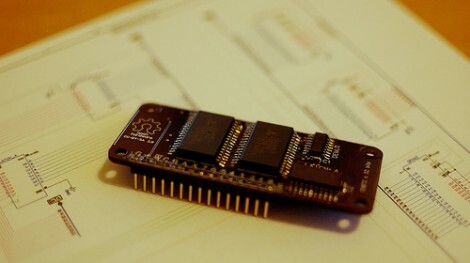 [Wardy] has been testing his design using a Propeller chip running at 75 MHz so we know it’s built for speed, but he also mentions there’s no minimum clock speed for the board to function either. He used the Open Hardware guidelines when sharing his work, and if you want one for yourself you could always give the DorkBot PDX service he used for the prototypes to get your own boards too. Looks like you might not be fully immersed in the digital world if you didn’t complete your chores. 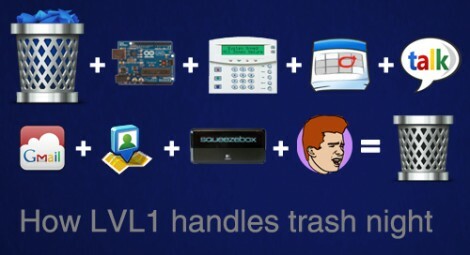 The members of the LVL1 Hackerspace have put together a lot of automation for their lair, but nothing drives home the utility of the system they call MOTHER like the shenanigan-preventing trash removal system. Or in layman’s turns, being nagged by MOTHER until you empty the trash can. So here’s a bit of background first. Remember that sensor array that just had way too many environmental sensors on it? That is just one way that the automation system (MOTHER) measures its surroundings. It seems the hackerspace has been building a pile of scripts to interface with just about every aspect of the community. For instance, the night before trash colletion the system starts by letting members know it’s trash night and someone needs to empty the garbage. There’s a pressure sensor under the can which alerts MOTHER to the fact that it has been moved. But what if nobody moves the can? Say goodbye to Google. Yep, it’ll block all Google searches until the chore is done. And that’s just one punishments in its bag of tricks. So what if you just move the can and don’t take it out? No dice. MOTHER is also monitoring the garage door which needs to be open to get the extra-large can out to the dumpster. You’ve got five minutes to do that before she starts getting nasty. After getting his hands on an Android-enabled wristwatch, [Paul] wanted to test the limits of his new hardware. We’ll assume he’s happy with his purchase because his finished build sends data from a Microsoft Kinect to his wristwatch, making it a night vision spy watch. [Paul]’s new toy is a WIMM One Android wristwatch that comes complete with wi-fi and a copy of Android 2.1. To get night vision onto his watch, a Kinect on [Paul]’s desk streams depth data to his watch using OpenCV. The result is a camera that gathers depth data in the dark and sends it to [Paul]’s watch. Whenever the movement of an intruder is detected, [Paul]’s watch vibrates and displays the depth image taken from the Kinect. If the intruder gets close to the Kinect, the face is picked up and also sent to the watch. To get the intruder out of the room, [Paul] can tap the face of his watch to turn on a remote alarm and sound an intruder alert. It’s a very neat project that would have been unimaginable a few years ago.